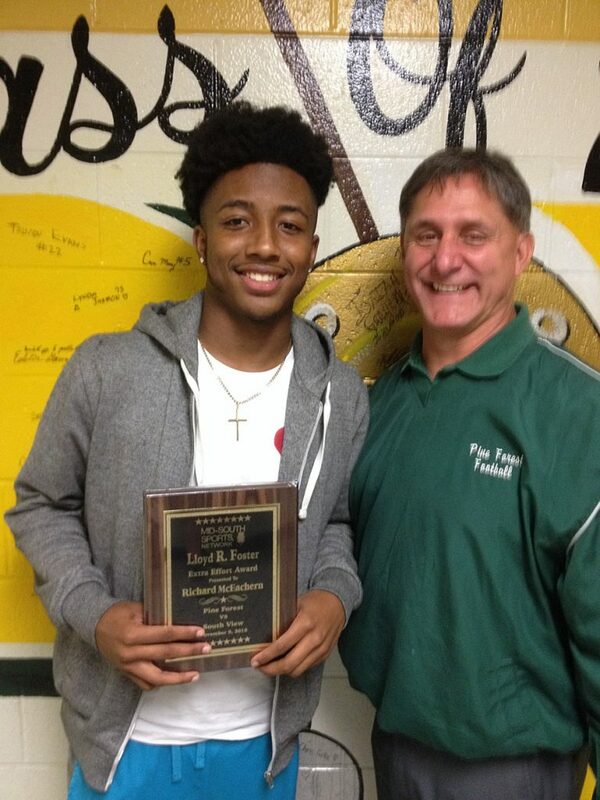 Emery Simmons is the first recipient in 2018 of the Lloyd Foster Extra Effort Award. The South View wide receiver caught nine passes for almost 180 yards in a victory over Jack Britt. Congratulations Emery! 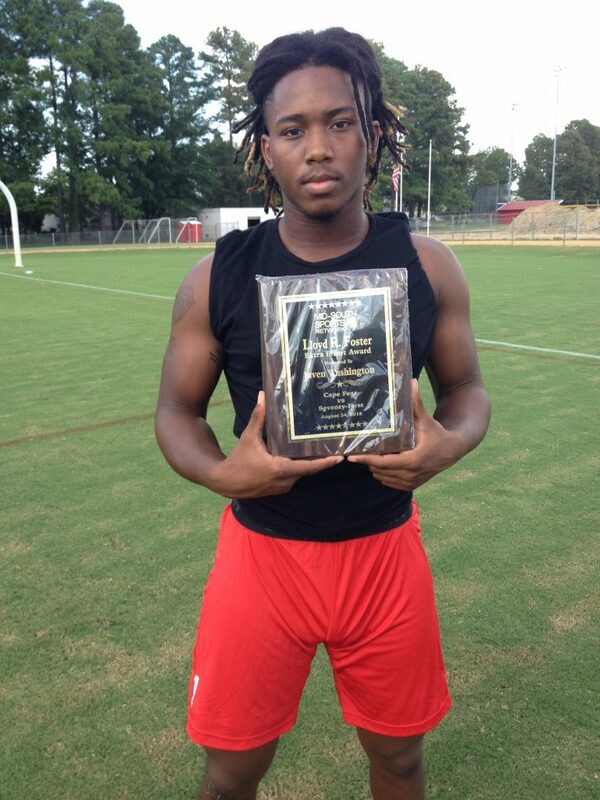 Javen Washington of the Seventy First Falcons is week two’s recipient of the Lloyd Foster Extra Effort Award. The Falcons’ defense shut out the always tough Cape Fear Colts 25-0. Javen amassed 15 tackles, thre tackles for a loss, three QB sacks, and caused a fumble. Congratulations Javen! 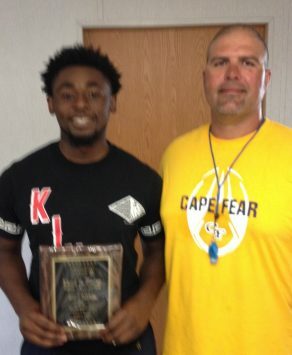 Zaire Boykin of the Cape Fear Colts was awarded the Lloyd Foster Extra Effort Award for his efforts against theWilmington New Hanover Wildcats. Zaire gained almost 100 yards on 14 carries and was instrumental in avenging two losses to the Wildcats last year. With Zaire is Head Coach Jacob Thomas. Congratulations Zaire. 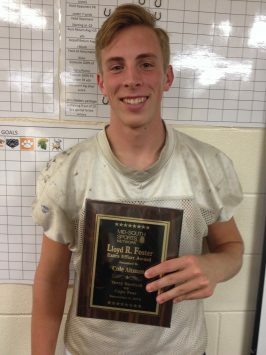 Cape Fear’s Cole Altman is this week’s recipient of the Lloyd Foster Extra Effort Award. Cole helped his Colts defeat Terry Sanford with spectacular play on special teams. Cole amassed four pancake blocks, and made two touchdown saving tackles on kick returns. Congratulations Cole! 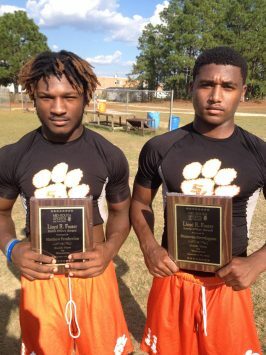 Matthew Pemberton, running back, and Donovan Brewington, quarterback, of the South View Tigers are the recipients of the Lloyd Foster Extra Effort Award this week. Both had career games in helping the Tigers defeat the Westover Wolverines. Pemberton amassed almost 300 total yards and scored 3 touchdowns, while Brewington threw for almost 250 yards and six TD’s. Congratulations Matthew and Donovan! 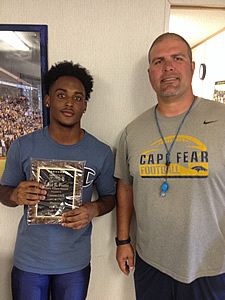 This week’s recipient of the Lloyd Foster Extra Effort Award is Lamon Lock, cornerback for the Cape Fear Colts. In a tight game only leading by five points, Lamon made an open field, game saving tackle in the final minute of play to defeat the Westover Wolverines. His tackle preserved a hard fought victory. This award is sponsored by Jimmy Keefe at The Trophy House and Clark Sporting Goods and presented by Mid-South Sports. Standing with Lamon is head coach Jacob Thomas. Congratulations Lamon! 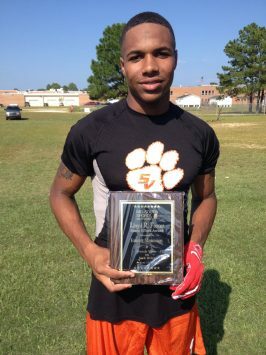 The Lloyd Foster Extra Effort Award is presented to Dorian Clark of the Terry Sanford Bulldogs. Dorian led his team in a shootout defeating the Tigers of South View and handing them their first loss of the year. Dorian scored three touchdowns and picked up 188 yards on just 16 carries. With Dorian is head coach Bruce McClelland. Congratulations Dorian! 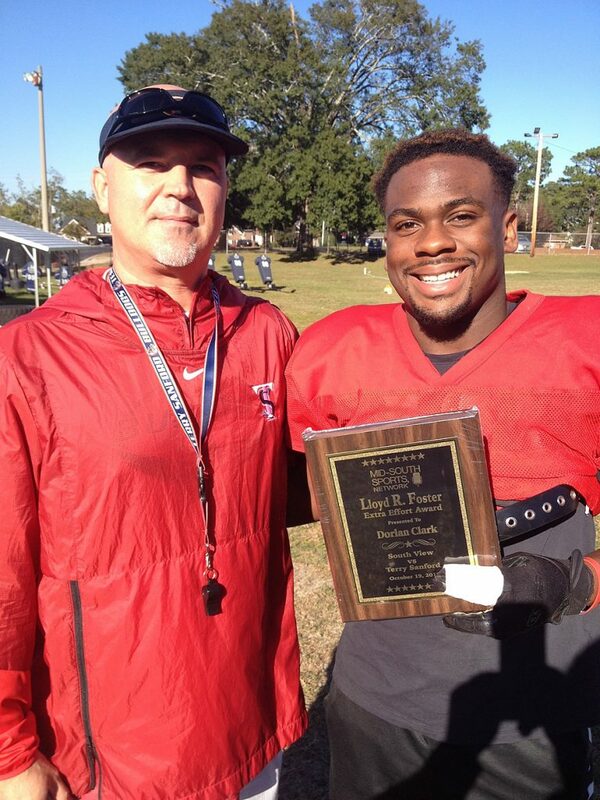 This week’s recipient of the Lloyd Foster Extra Effort Award is Pine Forest QB Richard McEachern. Richard led his Trojans to a strong victory over the South View Tigers to win the Patriot Athletic Conference. He rushed for 70 yards and hit on two big touchdown passes to secure the 14 to 7 victory. Congratulations Richard! Pictured with Richard is head coach Bill Sochovka. 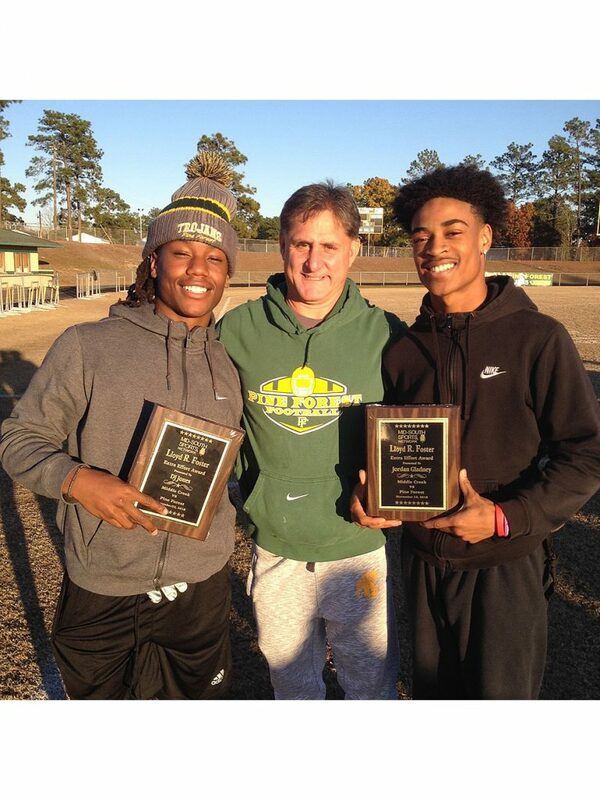 DJ Jones and Jordan Gladney are this week’s recipients of the Lloyd Foster Extra Effort Award. DJ ran for over 150 yards and scored two touchdowns on 20 carries. Jordan, in addition to helping lead a defense that stifled Middle Creek’s offense, ran back a punt 95 yards to open the scoring for the Pine Forest Trojans. DJ on the left and Jordan on the right, are joined by head coach Bill Sochovka. Congratulations DJ and Jordan!